A beginner and new to the studio? This course is the full fundamentals of pole and can be repeated as many times as you like. NO, you do not need to have experience or be super strong to do this course. ALL ages and fitness levels are welcome. 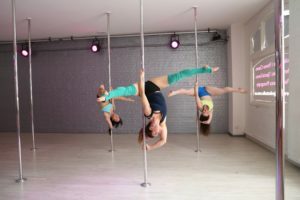 Over 8 weeks you will learn on your very own pole… An introduction to pole, heaps of skills including moves, spins, strength, conditioning, an introduction to climbing and basic aerial tricks (optional). Includes fun beginner dance routines and try the spinning poles in week 8. Complimentary Welcome Pack full of valuable info and goodies. BOOK NOW OR CONTACT THE STUDIO TO ORGANISE A PAYMENT PLAN. This course is the full fundamentals of spinning pole (the pole spins with movement) and can be repeated as many times as you like. An introduction to spinning pole, a very graceful and different style of pole to static. Heaps of skills including moves, spins, strength, conditioning, an introduction to climbing and basic aerial tricks (optional). Includes fun beginner dance routines and try the static poles in week 8. It’s time to attempt more challenging tricks and get aerial! This course is full of intricate spins, basic aerial tricks, inverts, dance moves and routines. Continue to develop your technique, build strength and start pole combos. Foundation training is extremely important. We recommend students training in this level and above to allow a few terms to master all skills correctly and confidently before moving up. Also, extra pole training outside class time in practice, casuals, or investing in a pole for home is a great idea. Your guns are starting to show and you are developing pole style! In this course you will be introduced to some more challenging aerial tricks and begin to develop freestyle dance. Short routines, basic aerial trick combo’s and more intense strength training included. Basic balance, handstands and aerial V’s are introduced. Highly recommended to do 2 or more pole sessions per week to focus on the exciting and challenging skills in this course. Let the real acrobatics begin. This is not your regular workout session now and to master skills in this course while spinning in a beautiful controlled pace takes time and dedication. Multiple sessions per week and investing in your own pole for home is not a bad idea when training in this level and beyond. This course is filled with creative dance, floor work, transitions and aerial tricks. This is not your regular workout session now and to master skills in this course takes time and dedication. Multiple sessions per week and investing in your own pole for home is not a bad idea when training in this level and beyond. This course is filled with creative dance, floor work, transitions and aerial tricks. Making the transition into Advanced. This is an exciting time and a big step up from the intermediate levels. Includes detailed introductions to those core advanced skills including handsprings, push out V’s, shoulder mounts, shotgun grip and more. Strength and conditioning are the focus of this course and developing an understanding of how to execute these core skills correctly and safely for progressions in the advanced levels. Advanced Prep is fun and challenging. Defying gravity at last! This course if full of aerial trick combinations, strong holds, spinning push out V’s and beautiful shapes. Freestyle dance, pole games and intense strength training are included. At this level students are encouraged to develop their own routines and dance style. There are strength and flexibility requirements for this level. This course is full of aerial trick combinations, strong hold movements and heaps of handsprings. Freestyle dance, pole games and intense strength training. At this level, students are encouraged to develop their style and work towards solos if their goal is to perform and compete. There are strength and flexibility requirements for this level. You are well and truly one dedicated pole dancer now! The dance and trick combinations in this level are extremely challenging with a high level of skill. Focus is on perfecting each trick to performance quality with correct technique and beautiful lines. The Syllabus is set with a list of tricks to be mastered before moving up to Advanced 3, but you can expect new and creative tricks and progressions thrown into the mix each term to keep it fresh! The dance and trick combinations in this level are extremely challenging with a high level of skill. Focus is on perfecting each trick to performance quality with correct technique and beautiful lines. The Syllabus is set with a list of tricks to be mastered before moving up to Advanced 3, but you can expect new and creative tricks and progressions thrown into the mix each term to keep it fresh! This level is our highest advanced level of spin pole at the studio taught by our pole champion Megan B. This is for the highly experienced and fearless poler. Every term are new challenges and brand new tricks to master. The skills taught in this level are a mix of strong, dynamic, flexy and the goal is correct technique, perfect lines and making everything look effortless. Train towards in house performances, solo competitions or just to challenge and motivate yourself! This level is our highest advanced level of static pole at the studio taught by our pole champion Megan B.